Having a home built to your specifications allows you to get the best house for your money. Most homeowners start the construction process by choosing a general style for their future home. Windows are one of the most important parts of a home's exterior design. Find out how to pick modern, energy saving windows that match your favorite style for a cohesive look and great performance for years to come. Tall, simple double hung windows are an excellent design choice for farmhouses and country style structures of all kinds. Since these homes tend to feature gable roofs and high peaks, the vertical lines of the windows help draw the eye up and down while letting in plenty of light. They also give you a lot of curtain options for decorating on the inside. This style is all about simplification, so stick to double hung windows or even plate windows for a slightly modern twist. Avoid windows with a lot of exterior decoration or multiple panes. Square-paned windows with many small panes can work as a distinctive feature window with this home style, and consider casement windows as well to maximize air flow in areas with limited space. 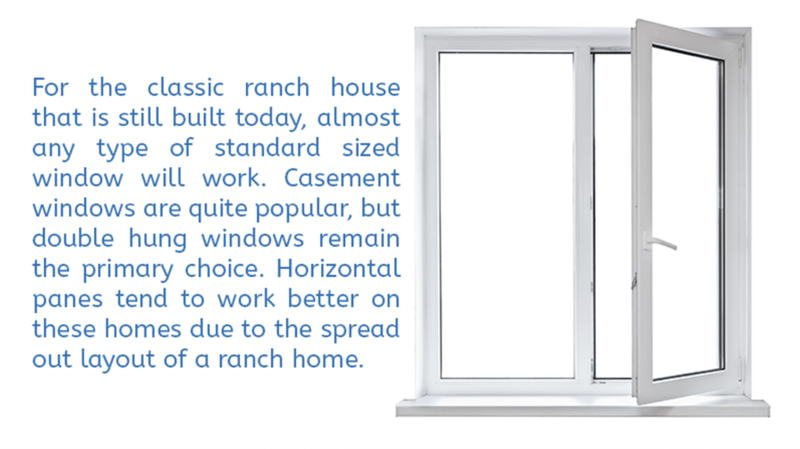 For the classic ranch house that is still built today, almost any type of standard sized window will work. Casement windows are quite popular, but double hung windows remain the primary choice. Horizontal panes tend to work better on these homes due to the spread out layout of a ranch home. From beach cottages to Cape Cod mansions, this American style with nearly three centuries of history requires a special type of double hung window for true historical accuracy. Look for Cape Cod windows that have a height difference between the top and bottom panes. Most homes in this style feature a taller top pane, but it's up to you as the homeowner. You can also try a casement window design to look like these traditional hung windows. Colonial homes are stately estates that dot the areas around Chicago, Boston and many other Atlantic seaboard towns and cities. These traditional homes require specialty windows, or at least decorative trim to give the appearance of curved lintels over the tops. Some Georgian homes are best complemented with highly ornamented lintels featuring scrollwork and flourishes. These windows also tend to have the most complex grille patterns, with up to 12 panes per window for a distinctive look. Once you've chosen your home style, our team here at Nea Maya can help you build your dream house around that choice. Of course, we can also give you plenty of advice on designing your own custom style from scratch, or with remodeling another property you already own with new windows and more. "Nea Maya is a solid, experienced company to work with – one with great pride in their work, which is highly detail-oriented. And the results are both functional and aesthetic." "Zach simply has an eye for this work and is very thorough. He can see many steps ahead which allowed for advance planning and alterations." "Aida is a 'showroom queen' and did an exceptional job of creating the look we wanted in our kitchen and baths. She patiently guided us through all the laborious details and process." "This was a huge job: a brand new home with many unique demands. Nea Maya did beautiful work and we are extremely grateful." "What a wonderful and pleasant experience! First-time home owner, and the design team at Nea Maya really helped put my vision together and built my dream kitchen within my budget. Thank you Nea Maya!" "The most knowledgeable contractor I have ever worked with." "Beautiful and talented people. You will not be disappointed with Nea Maya. They have a very friendly staff and a beautiful showroom. Give them your house – or any room in your house – and it will feel as if you're walking into a magazine. Check them out !"